The Cricketers Fryerning01277 352400work Restaurant - PubThe Cricketers at Fryerning is a 19th century Grays house that has a reputation for serving delicious food in a warm and friendly atmosphere. An excellent choice of ales and a good wine list supports a mainly traditional menu, available lunchtimes and evenings except for Sunday and Monday nights. 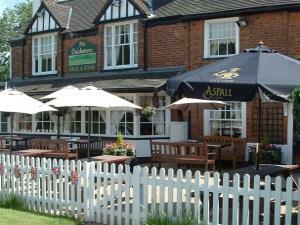 The pub boasts a large attractive beer garden, well away from the main road and ideal for customers with small children. Both ramblers & cyclists, journeying through this pretty part of the countryside, are made most welcome at the Cricketers. The Cricketers at Fryerning is a 19th century Grays house that has a reputation for serving delicious food in a warm and friendly atmosphere. An excellent choice of ales and a good wine list supports a mainly traditional menu, available lunchtimes and evenings except for Sunday and Monday nights.